Simplilearn is one of the largest online platforms for certification training. CISA is one of the 40 certifications on the list. More than 5,900 students have gone through this course, with a 4 out of 5 rating from more than 370 students. Save 30% with this Simplilearn CISA Discount! Save 30% with This Code! The Simplilearn CISA video instructor is Chuck Easttom, an experienced professional in computer science and security, an author of 20 books and an inventor with six patents. I like Chuck’s style in explaining things that every one can understand, and in a clear, relaxed manner (you can view his introductory video on Simplilearn CISA page). Each domain is 2.5 to 3 hours long divided into many sub units. Each unit is no longer than 25 minutes, with most under 15 minutes. There are 4-5 quizzes and 1-2 case studies towards the end of each domain with full answer explanations. The mock exam at the very end will be graded by Simplilearn with a 80% passing mark — higher than that for the actual CISA exam to make sure you are fully prepared for the exam. 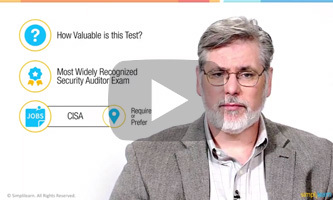 This course addresses the weakest points of CISA Review Manual — that the concepts are not explained thoroughly and that the book itself is pretty dry. They complement perfectly with each other. This is probably the most attractive about Simplilearn: if you don’t find the course helpful, they offer a 7-day money-back guarantee. As long as you send in a refund request within 7 days, 100% will be refunded and no questions asked. Afterall, Simplilearn offers courses for all sorts of professions. The course feels too “institutionalized” with little personal touch. Other than the few sample questions after each study session, there isn’t a set of practice questions that you can work on. There are 1,000 questions — 200 each in the 5 simulated exams. At $599, it is a bit less expensive than CISA SuperReview (a fully integrated review course) and Surgent CISA (a practice question database with a basic reference book). There is also a higher-end, $1,199 version of Simplilearn with more features and customer service. This option is called the Online Classroom Flexi-pass, so if you need a more structured review, this may be a good option for you. If you really like how Chuck teaches you the concepts and use that to supplement your core material, go ahead and sign up for Simplilearn (there is a 7-day money-back guarantee). Or if you have a larger budget and need a structured course, the Online Classroom Flexi-pass might be a good fit for you. Check out Chuck’s Introductory Video Now! Thanks for sharing May, although, I have to say, if it is well past 7 days, I would say not refunding is the standard and not “fraudulent”…?